The kitchen was pretty nasty as well, like the bathroom, but this time with grease. 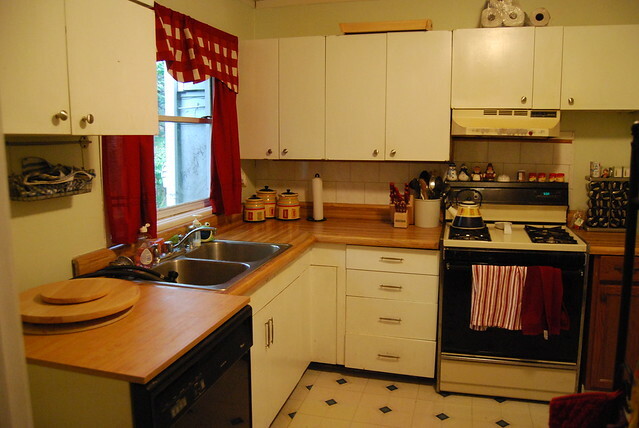 We used a heavy degreaser on all the cabinets and other surfaces, which did seem to help. We also put knobs on the cabinet doors to prevent further fingerprints and grease. 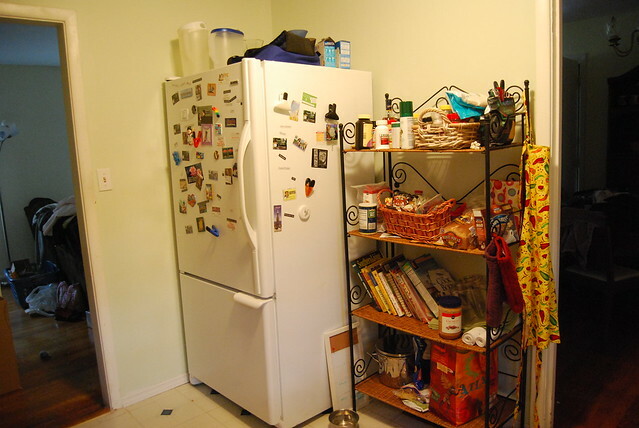 The previous owners did not leave their refrigerator (which was yellow, so I wasn’t too upset), so we bought a new one when we moved in, but otherwise haven’t changed much. 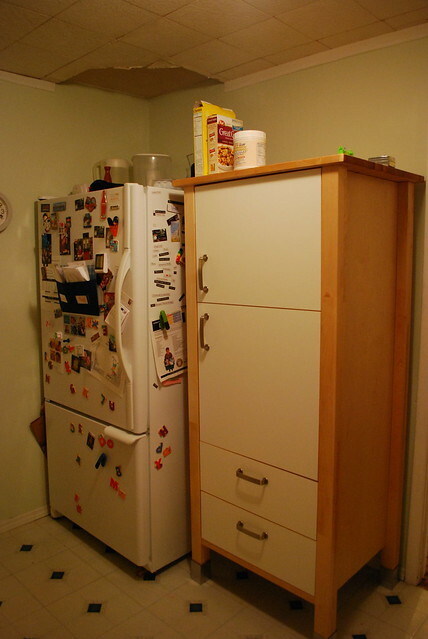 To get our fridge to fit height-wise, we had to remove the shelf and cabinet that were previously here. We moved it over above the dishwasher. Since there was no pantry, we got a baker’s rack to hold all our pantry items and cook books. We also took down the paneling and painted the walls. I was hoping for a darker green, but it ended up being more of a mint green – whenever we redo the kitchen we’ll definitely change the color. We had to strip two layers of wallpaper off, which was very challenging. 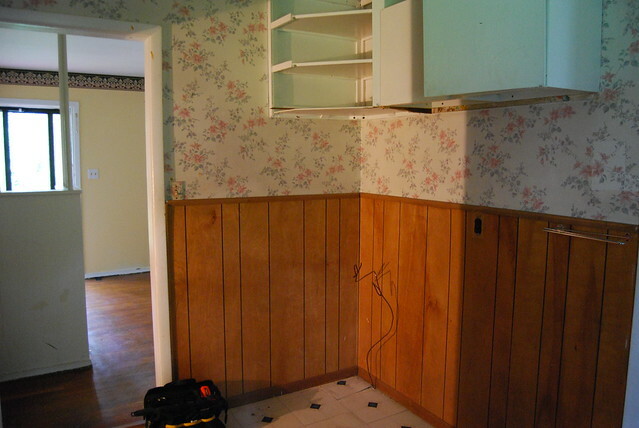 We didn’t even bother above the cabinets – we just painted over the wallpaper. You can see the faint flowers through the paint now, but again – something else to take care of when we redo the kitchen. I’m glad we have a dishwasher, but I don’t love the portable one. It hooks up to the faucet and drains into the sink. 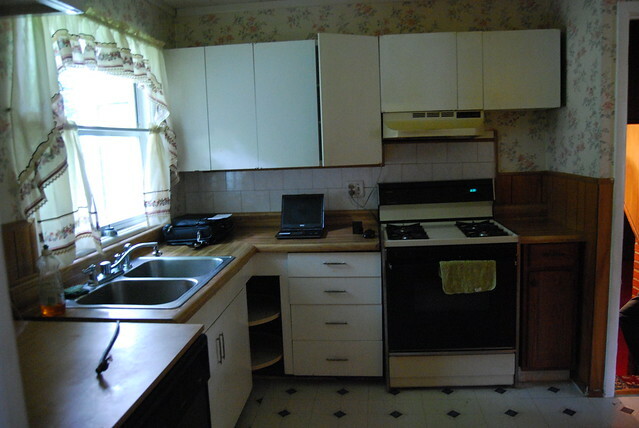 Apparently I have not taken any updated pictures of the kitchen, so I’ll try to do that soon. The baker’s rack worked fine for our pantry until our daughter got old enough to get into it. So, we purchased a large cabinet from Ikea to serve as our pantry. We love it – it has worked perfectly for our needs. 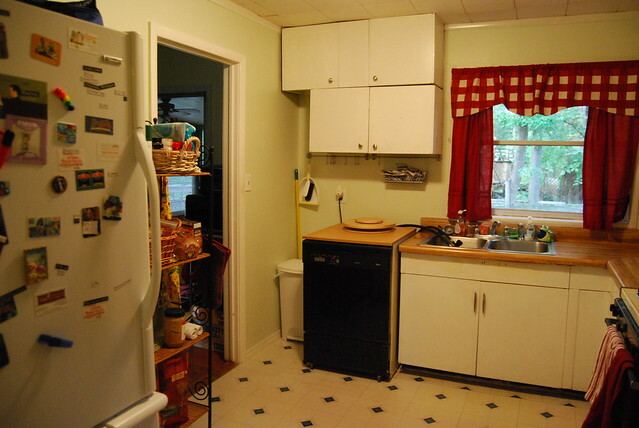 We had trouble finding a pantry because the HVAC vent is on the floor right underneath. We were glad to find a cabinet that was raised off the floor 6 inches so as not to impede the air flow. Bought and hung red curtains over the window. Removed shelf and cabinet; reinstalled cabinet above dishwasher. Added knobs to all the cabinets. Bought a cabinet to use as a pantry. You can read all the kitchen posts here.